This is an extract (courtesy of Birmingham Central Library) from the 1927 Ordnance Survey map of Worcestershire No.39.10 (surveyed 1926). At the top of the map is a part of the quarry face showing the Drum and part of the railway at the Tank Quarry although much of the quarry is further north. The Tank Quarry was separated from the North Quarry by the Malvern Urban District Council reservoir and the clock tower. 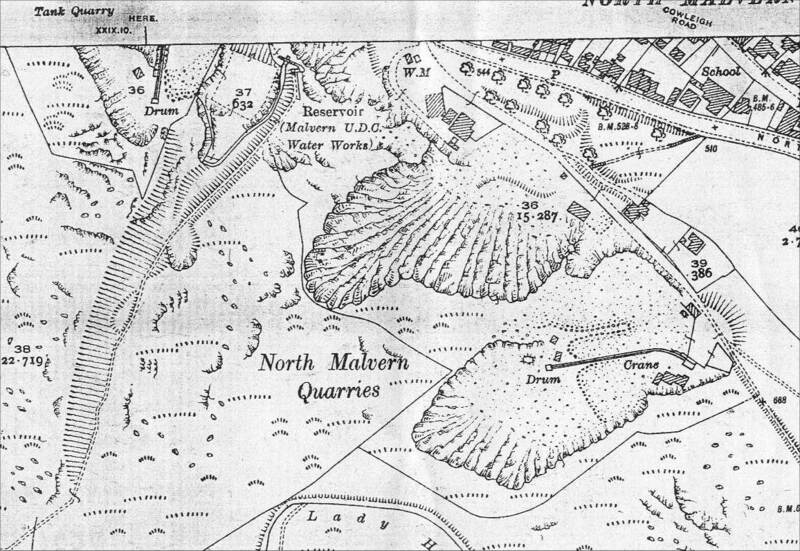 In the middle of the map is the North Quarry where there are few buildings. Further south is the Scar Quarry and the narrow gauge railway, crane and quarry buildings are all illustrated.